The 楽・Seasons Course is a distance flower course provided by Zen Flowers suitable for home flower arrangers. 楽・Seasons instruction is provided through self-paced step-by-step guides available only from this website. The course is suitable for anyone from beginners to experienced home flower arrangers. Each Seasons Course is independent with different courses released on an adhoc basis. An 楽・Seasons e-Course is a great way to prepare for the 箱・Hana One Day Flower Course. So if you are thinking of booking one of our main courses, why not download a 楽・Seasons course first? Please use the form below to get a 楽・Seasons e-Course booklet and begin your path to floral enlightenment today. Zen Flowers releases 楽・Seasons Course on-line throughout the year. This season's course is titled "Hoshi". 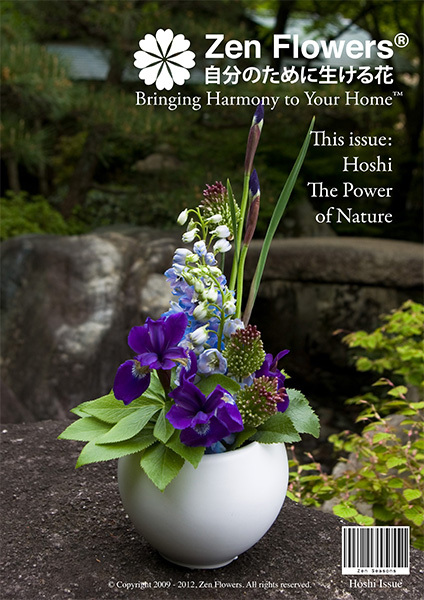 Hoshi means Star in Japanese and in this Zen Flowers® Zen Seasons™ lesson we will create a parallel design that symbolises the strength and beauty of natural growth. Thank you for your Seasons e-Course order. As soon as we confirm payment from our card processor we will e-mail you a copy of the course to the e-mail address you supplied with your PayPal payment. This can take between 24 and 48 hours. Please feel free to contact us if you haven't received your copy by then. Zen Flowers has a course for everyone. From our distance 楽・Seasons e-Course to our Professional 禅・Fowers Art Course, whether you are just starting out or are already an experienced professional, Zen Flowers has the right course for you. All of our courses are taught in English and are available around the world. Zen Flowers keeps its international courses small so you get personal treatment. Places are very limited so please book well in advance to assure your place today. On the Zen Flowers 箱・Hana One Day Course you will learn more about Japanese culture and grow your flower arrangement skills. You will create 2 beautiful flower arrangements that fuse the best of east and west to lighten up any home and for special occasions. The course is open to learners and professionals alike and is only available at one of our flower schools. On the Zen Flowers 美・Hanataba One Day Course you will learn how to create beautiful bouquets that integrate the best of Western and Eastern cultural philosophies. You will learn 2 designs suitable for special occasions for your family and friends. On the Zen Flowers 粋・Preserved One Day Course you will learn how to create beautiful designs with preserved flowers and long lasting natural materials. You will learn 2 designs suitable for gifts and to brighten any home. The 禅・Art Professional Flower Course is our premier design course aimed at students who want to become flower professionals. On the course you will learn how to integrate Japanese culture into traditional western designs to create significant statement pieces for hotel lobbies, conferences or as statement designs in their own right. The course starts with a 2 weeks intensive experiance which you can book directly from our website. Study flower arrangement from the comfort of your own home with the Zen Flowers 楽・Seasons on-line course. Each Seasons course is provided in a simple PDF booklet you can download from our site. No prior flower experience is required and you will learn the basics while creating a beautiful design to bring light and harmony to your home. The 楽・Seasons course is a good foundatoion if you are thinking of coming to see us on one of our One Day courses. © Copyright 1997-2018 Zen Flowers. All rights reserved. Privacy and usage.